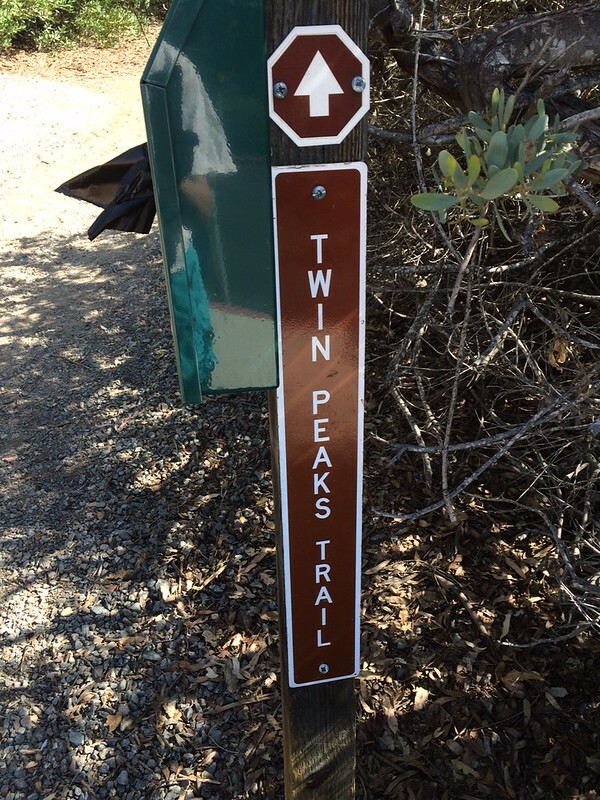 In the mood for a bit more of a workout, we set out this morning to hike up to one of the smaller mountains in this area of San Diego: Twin Peaks. From the trailhead at Silverset Park off Twin Peaks Road, you head up a fire road (AKA "truck trail", only usable by 4WD ranger vehicles and construction vehicles) until a smaller trail veers off to the left. Then you are on a nice piece of trail. Turn back and look to see how far you've come in a short distance, you understand why you might be feeling it in your legs. 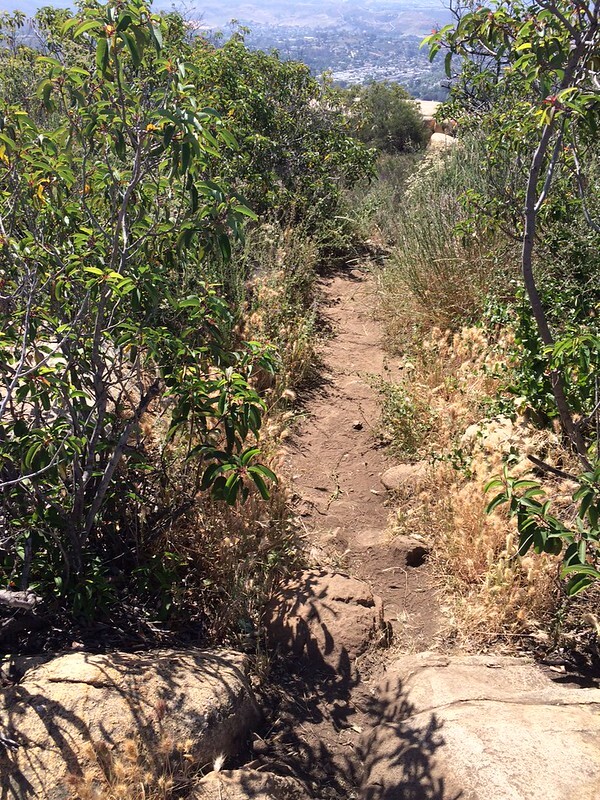 Alas, we climbed and climbed, going over trail that was far more primitive than any we've been on in a long time. There were also no people on this trail. It was only us, the birds, the flies, and a number of bees. The view was wonderful from this far up. 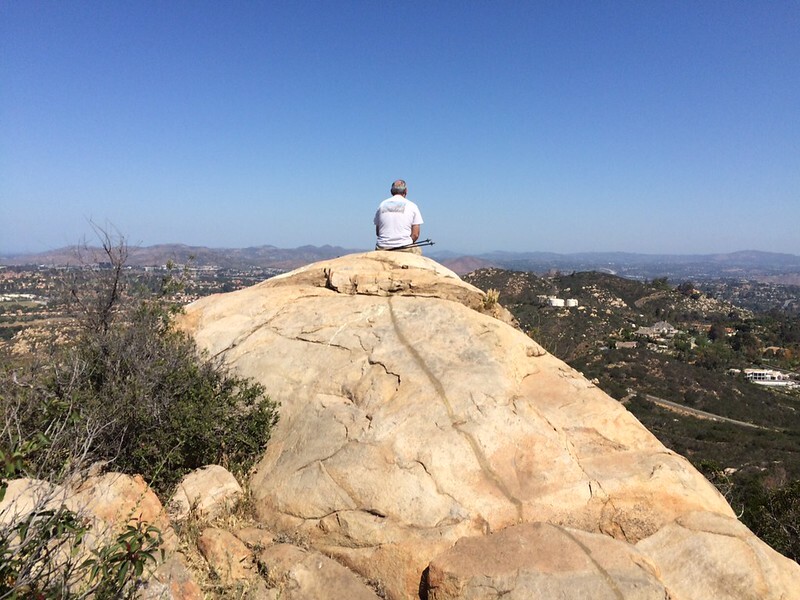 You could see Rancho Bernardo, most of Poway, a bit of Carmel Mountain Ranch, and a lot of Poway. And here we are, almost back to Silverset Park, 2.18 miles later. 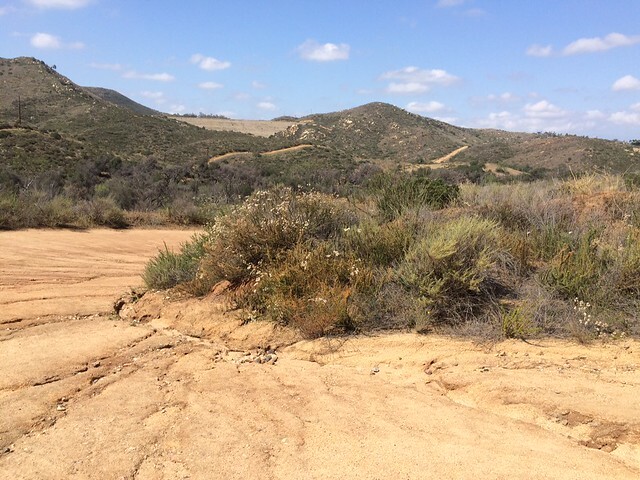 We have recently discovered that San Diego County is in the process of developing a system of trails that will eventually go from the ocean/coast, to the mountains east of the city, or "crest". 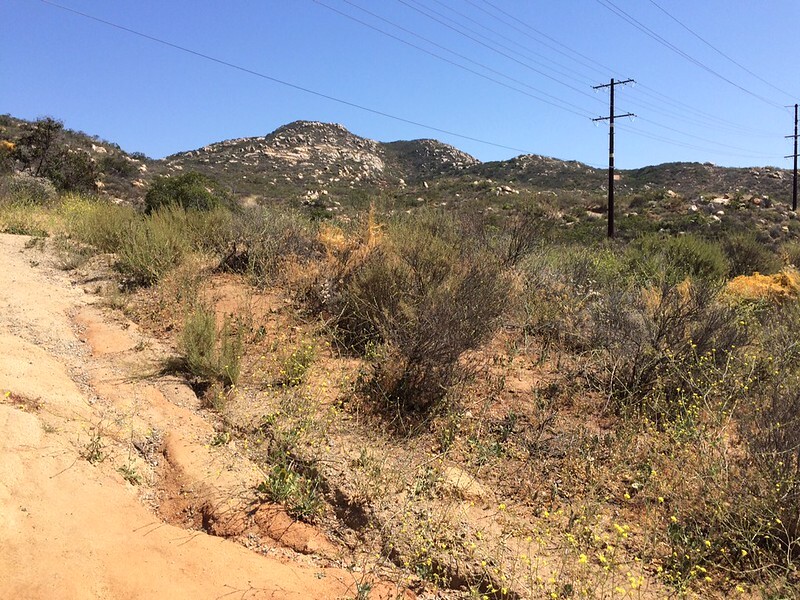 It's called the San Diego Trans-County Trail system. Over the past couple of days, we've hiked a few miles of it, just to see what was close to home. We've lived in the county for over 30 years and never knew anything like this existed, or was being built. 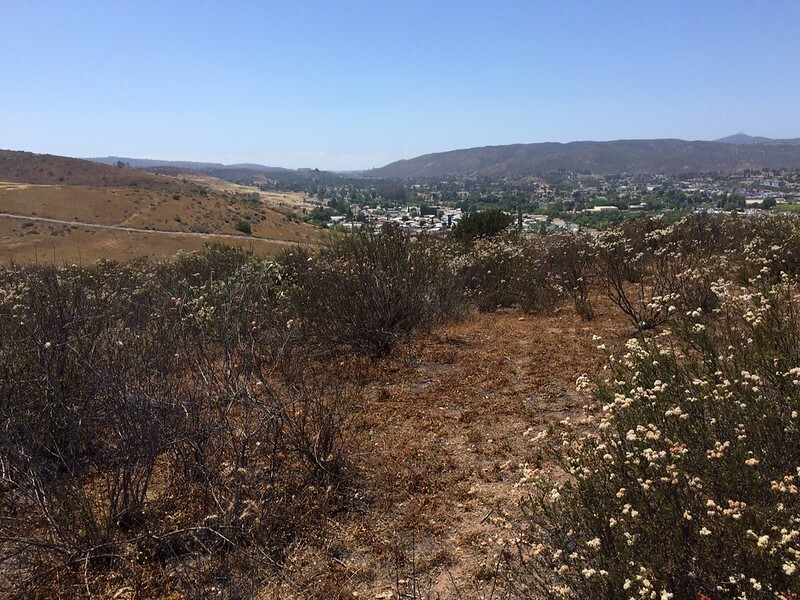 These hikes have continually reminded me just how large the Cedar Fire of 2003 was, and how much of San Diego County burned. However, I am also reminded at how diverse our county is. 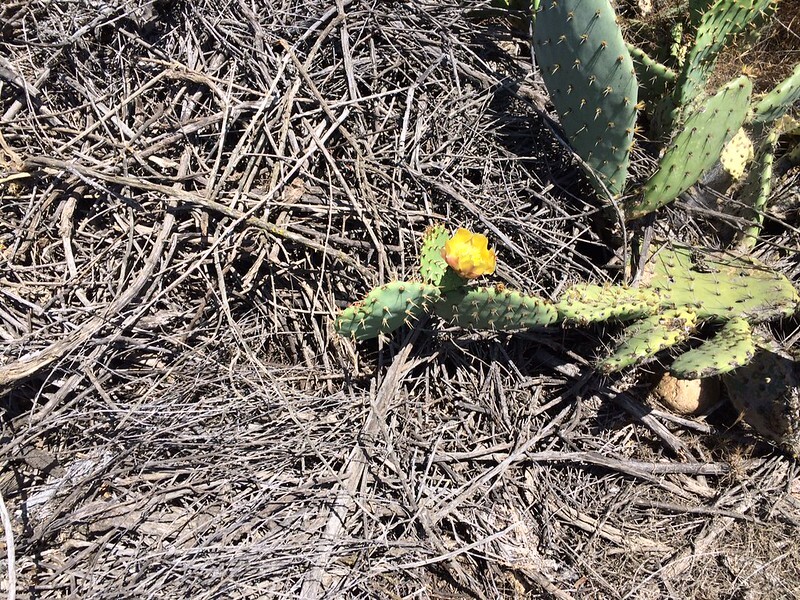 Here are cacti, reminding me that we are in a desert-like climate. 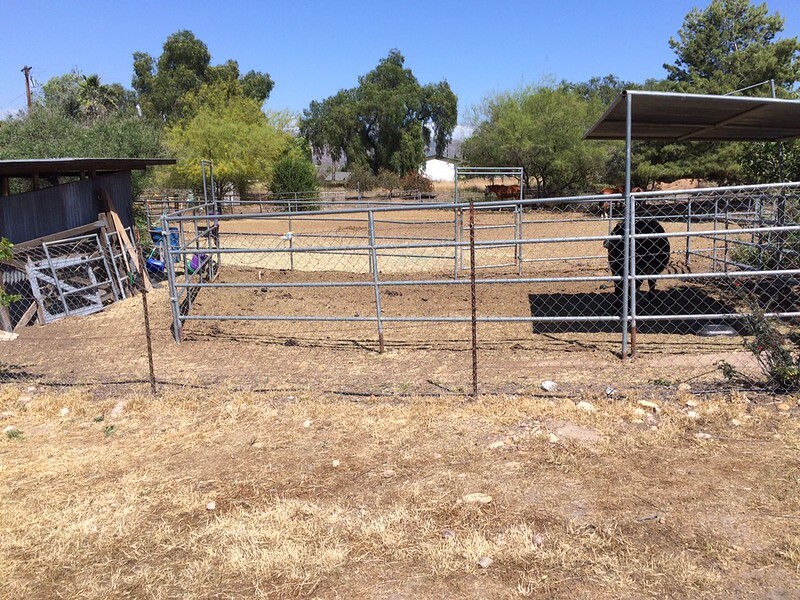 We think we live in a city, but here is a homestead where someone is raising a cow, some horses, and grapes. 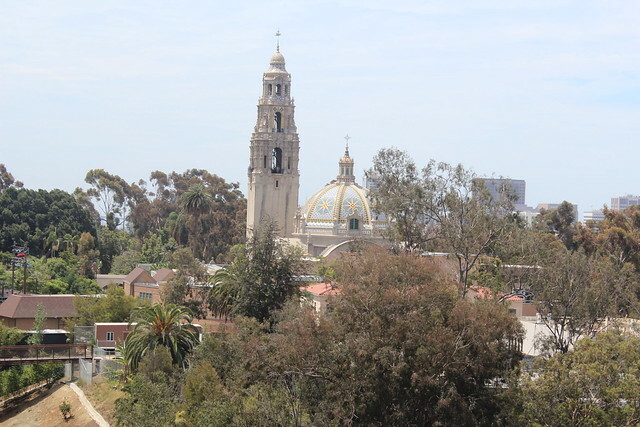 For Mother's Day, our family went down to Casa de Reyes Restaurant in the Bazaar del Mundo, part of Old Town San Diego. After a delicious lunch, we took a walk. 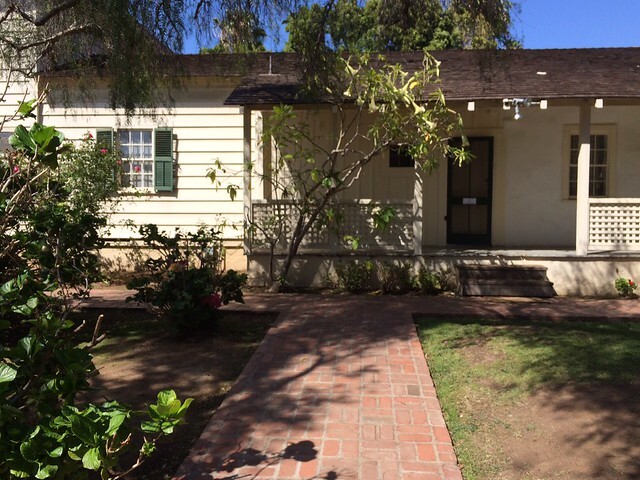 Along our route was the infamous Whaley House, a well-known place where paranormal activity has taken place. 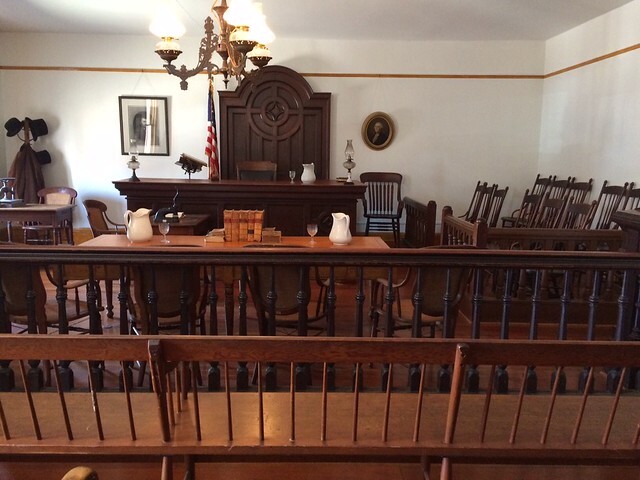 Believe it or not, we've lived in San Diego County over 30 years and have never toured the Whaley House, so we decided it was high time. Admission on weekends, for a self-guided tour (docents available) was a reasonable $6 for an adult. The others in our party headed for home, so it was just hubby and I doing this tour. If you follow the written tour, things are easy to identify and described in the brochure one is given. The first stop is the courthouse. 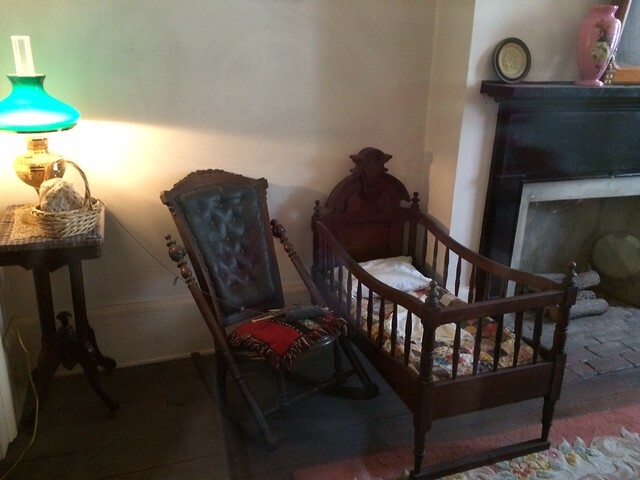 Over the years, a number of paranormal activities have happened in this room. 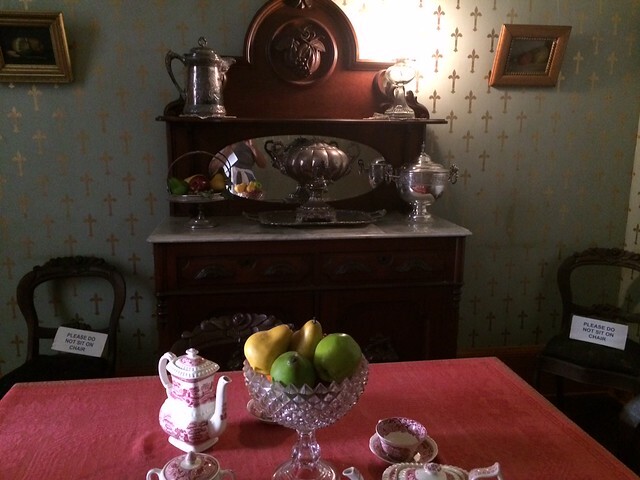 Our docent herself has witnessed 4 activities in her ten years at the House. One notable one was to walk into this dining room and the smell of bacon was very strong. Yet, walk outside or into another room, and she did not smell it. The odor went away about as quickly as it came, she described. I was surprised to see a theater in this place. It definitely had a small stage, and the audience might hold about 30 people at the most. The rocking chair in this particular bedroom has been known to rock at the strangest times. A local TV show, "Ken Kramer's About San Diego", featured this rocking chair and talked about this phenomenon. 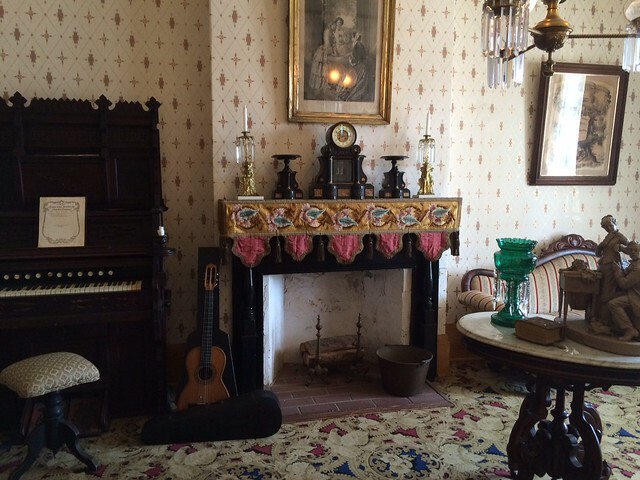 The parlor is the last part of the inside tour. I personally loved looking at the instruments in there. 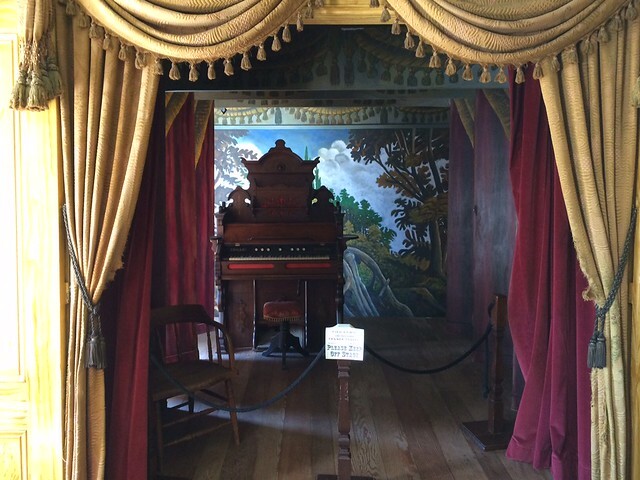 The docent told us that the pump organ works, but only the former director had ever played it. The rest of them were never allowed to do so. It hasn't been played since the former director moved on to a new job. That's a shame, as instruments should be played periodically! Outside there were some bushes, a few older buildings (one was a private office) and what had been a small garden. 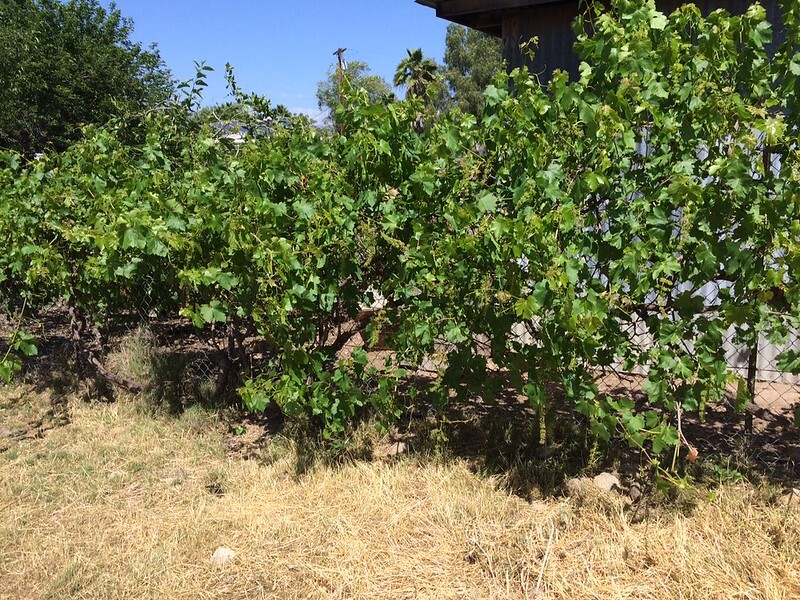 With our drought, however, it seems to have been neglected a little bit. 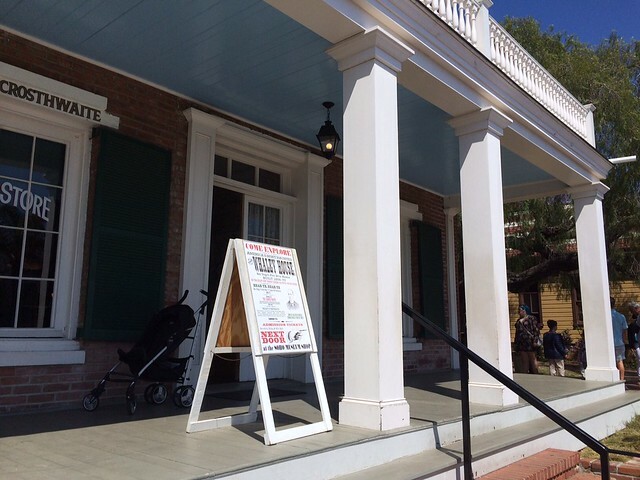 After touring the Whaley House, we walked back to our car and headed back for home. It was a lovely day. Happy Mother's Day, everyone! 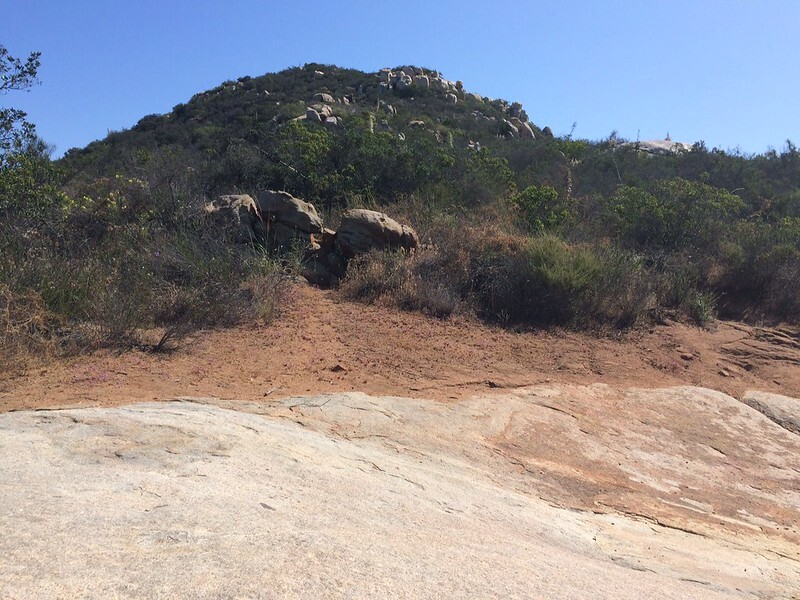 A few weeks back, we hiked through Blue Sky Preserve to Lake Poway, and noticed the trail to Lake Ramona (and could see the dam from there). With our weather finally settling down for a few days, today was the day to try that one to Lake Ramona. 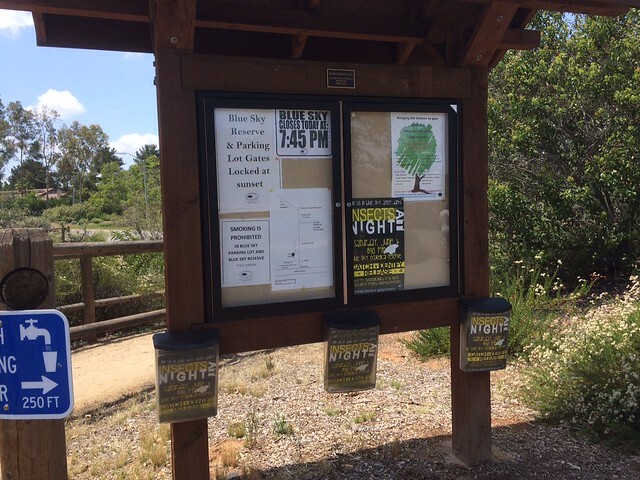 There are only two ways to get to Lake Ramona. 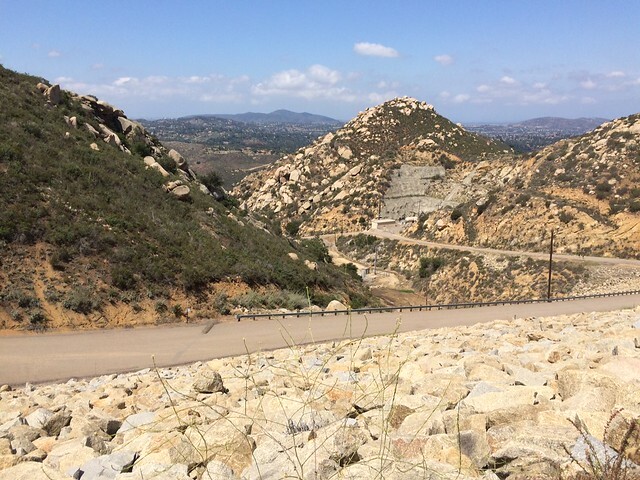 You either hike in, or you have a friend who works there and has access to the place via the road that comes in from Ramona. We hiked from Blue Sky. 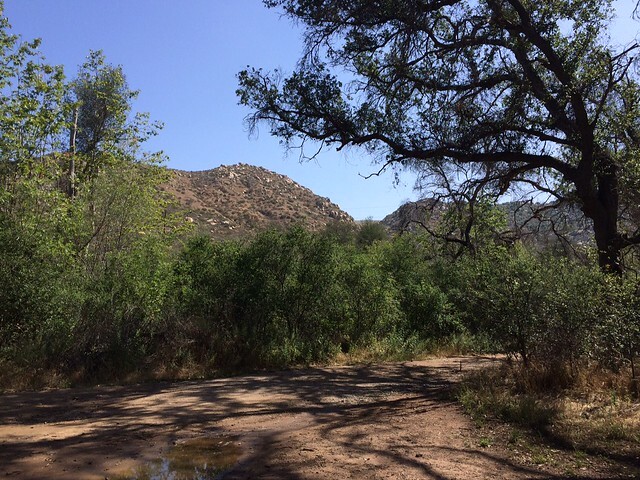 Green Valley Truck Trail showed signs of our recent rains; it was good to see puddles along the way. You hike about 9/10ths of a mile to the fork in the trail. 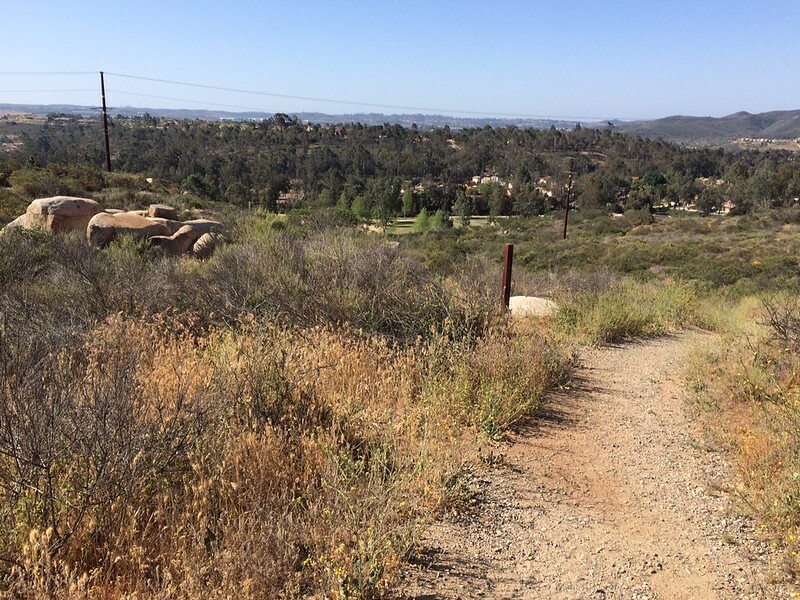 Lake Poway's trail goes off to the right, but the Lake Ramona Trail continues straight for about 2/10ths of a mile. This area was definitely affected by the Witch Fire of 2007 (I had mistakenly said the Cedar Fire of 2003, in my previous post). But it's grown out quite a bit. You veer off to the left and start heading UP after you pass a picnic area and porta-potty, nicely put there. The views are really lovely as you go up this trail, which is still labeled the Green Valley Truck Trail. Only authorized vehicles can get back there. You should turn back once in awhile, as it shows you the elevation change (if your legs or your altimeter app don't already tell you). 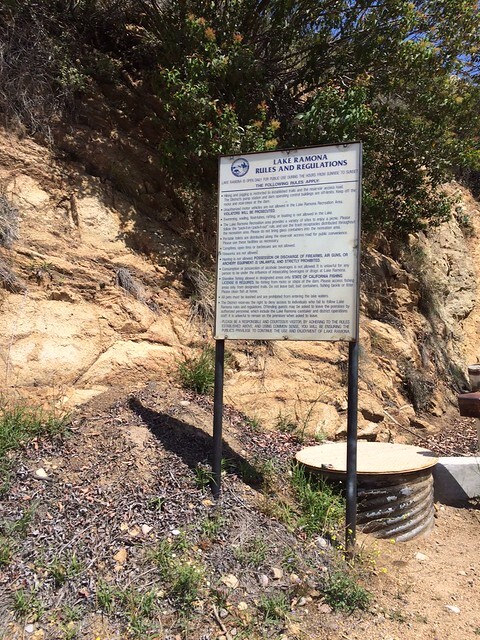 Up closer to the Ramona Dam, about 2 miles from the trailhead, you leave Blue Sky Preserve area, are on county land for awhile, then enter the area belonging to the Ramona Municipal Water District. 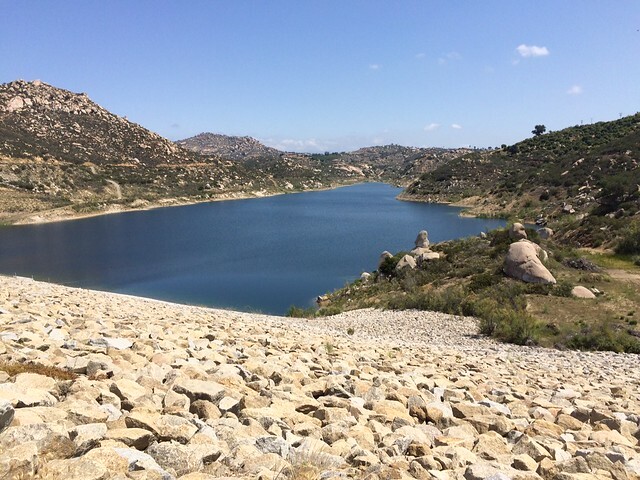 Lake Ramona allows fishing, picnicking and hiking, but no boats or swimming are allowed in the lake. You also start to hike on asphalt, so we had to change our hiking sticks from the dirt pointer to the rubber tips. 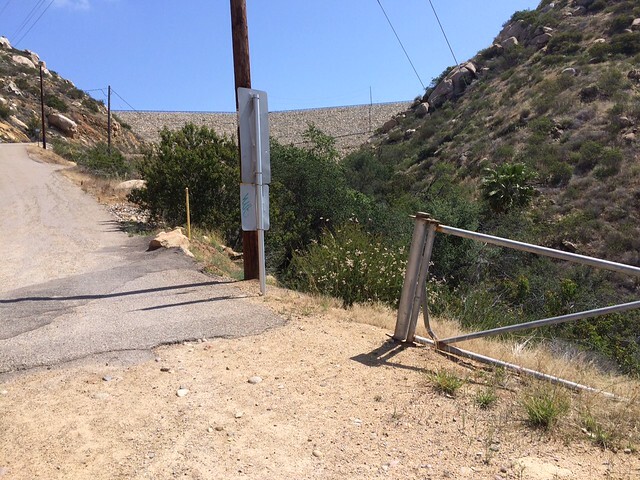 Alas, we reach Lake Ramona, and take a walk along the road on the top of the dam. We can see people fishing along the lake's edges on both sides, but decline to hike down the dirt trail to the lake edge. 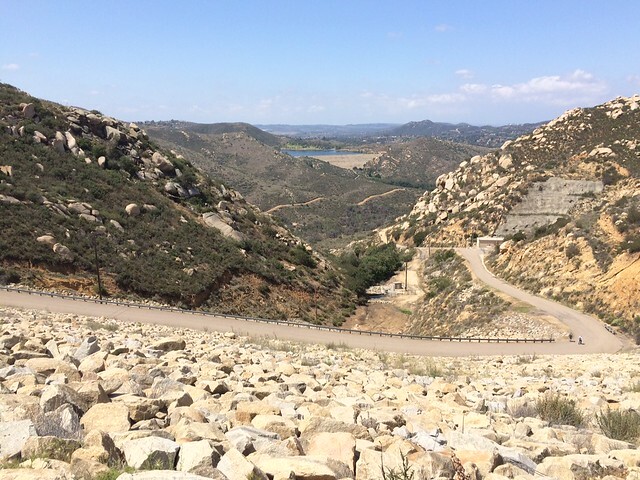 Nice view of Lake Poway from the road leading up to Lake Ramona. 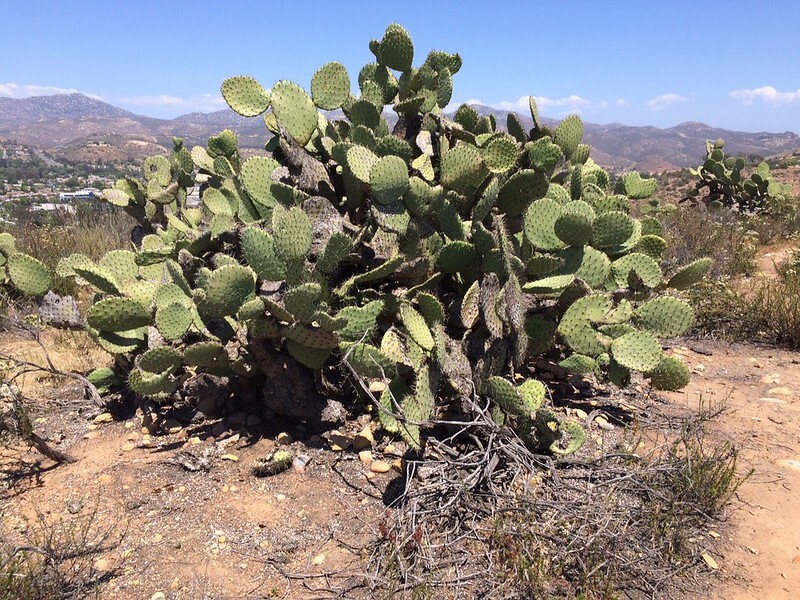 On the way back, on the main trail through Blue Sky, we saw a small rattlesnake slither across the road. He didn't rattle until he got into the sage, where my husband stopped at the side of the road and watched him for awhile. Not me -- I swung wide and hoped Mr. Snake didn't have a friend or spouse hanging around someplace nearby. Two and a half hours, and 5.6 miles later, we are back at the trailhead. We are tired, hungry, but we've had a good workout for the day and have seen a lake that only workers, local residents, and hikers can/will see. Summer portion of Staycation: Julian! 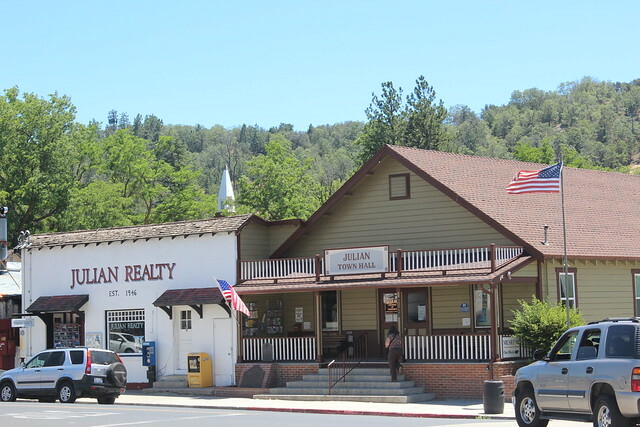 This morning, with 2 cars loaded, 5 adults and 3 small children, we headed toward Julian. This means going up Rt 67 to Ramona, then CA-78 through Santa Ysabel and into Julian. First real stop was at Dudley's Bakery in Santa Ysabel. This is known county-wide for delicious breads, rolls, and cookies made right there on the premises. On a windy day, you can catch the delicious smells if you are downwind. We stopped for a late breakfast, picking out rolls and cookies to eat on the stop. (Diet, schmy-et, while my family is visiting!) Showing what a small town I teach in not that far away, I ran into a colleague's son and his grandma. They had driven up JUST to pick up some bread. Now that shows you the popularity of this bakery locally! Next stop was in Julian itself. 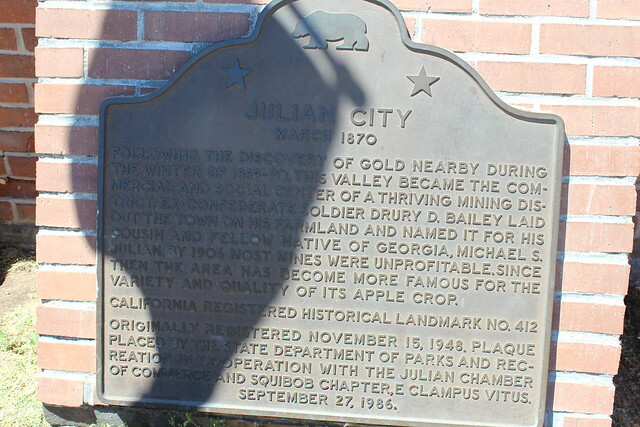 Julian is an old mining town whose fame now runs to apples (during the correct season) and wineries (any season). 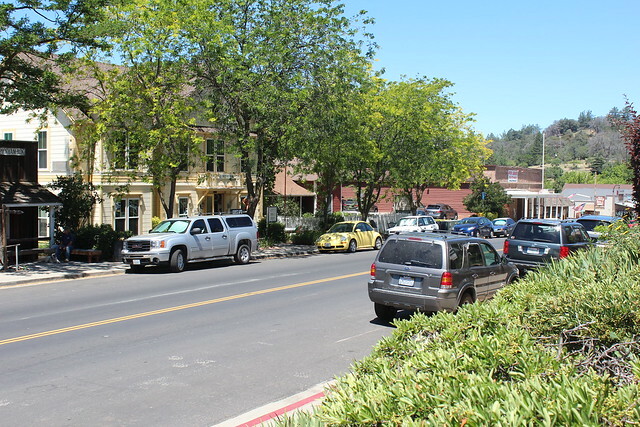 It's worth just walking around and looking at the many little stores (no chain stores or restaurants), doing wine tasting if you like at the 4 or 5 wineries in town, checking out the used bookstore. Today's temperatures were actually warmer in Julian than down in the north inland county. We had a lovely lunch at a place that served old-fashioned small town cafe' food, Rong Branch Restaurant. My husband had the chicken pot pie and said it was delicious. My younger daughter and I both had sandwiches on sourdough bread which was wonderful. Their kids' menu was pretty decent, too. We stopped for eggs at the egg ranch on the way back down the hill. Last edited by DonnaR57; 06-18-2015 at 04:20 PM. Another trip to Sea World! 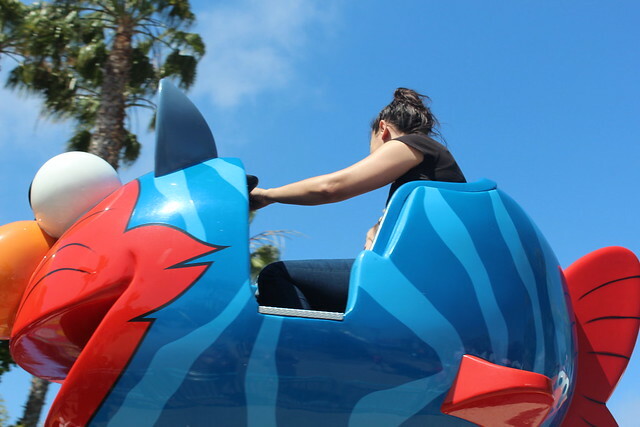 With a Fun Pass this year (basically a half season pass), we decided to head out as a family and do up Sea World again. So we went in three cars -- each daughter and her family, and us. We had guest passes for our oldest daughter and her family, so we only had to pick up a ticket for my husband. 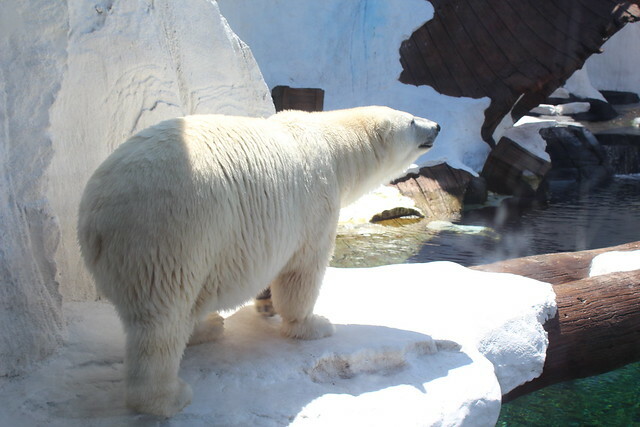 We went with a Fun Pass for him, too, so that he and I could return any time this summer for only the cost of parking and food. 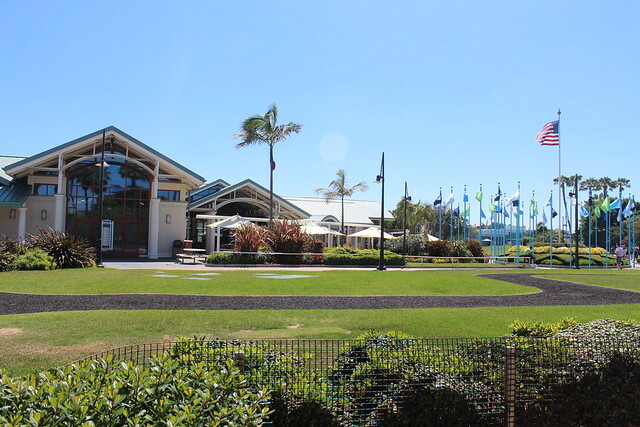 Hubby had the same reservations about Sea World that I'd had back in April, but came out with a better feeling like I'd had: "under new management, it seems a lot better". 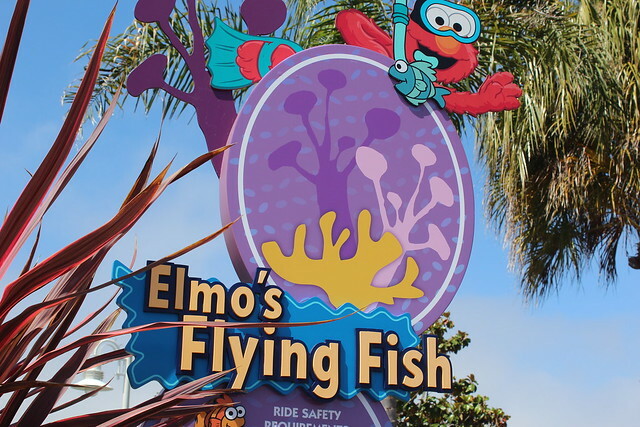 We took the children to the kiddieland, Sesame Street Bay of Discovery. Kids and adults rode two rides and the kids played on the bounce mat. 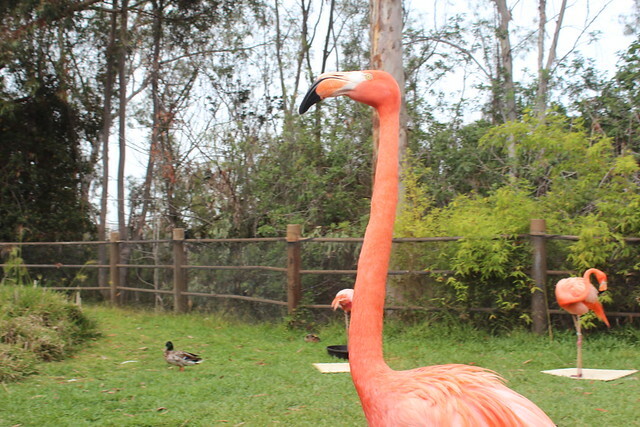 Then we headed for the east side, stopping at the flamingos (always my favorite), the penguins, and the Wild Arctic Zone. A bit of lunch again, then off to the west side of the park: The Turtle Reef, Dolphin zone, the Manta (where hubby, one daughter and her husband rode the rollercoaster and had a blast), and the sea lions. And so ended our day at Sea World. No, we didn't see any of the shows. Our grandchildren are all 3 and under, and won't get much out of the shows for a few more years. 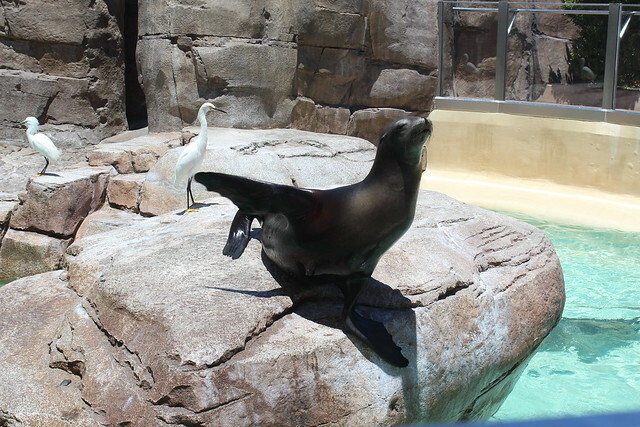 Perhaps my husband and I will return to Sea World, later this summer, and do up all of the new shows. 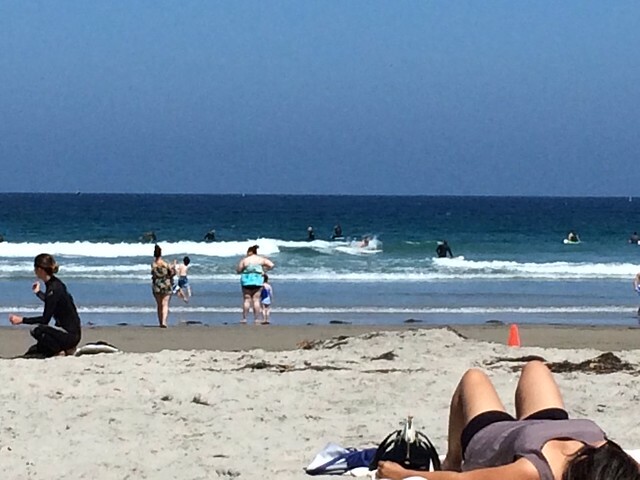 Today was Beach Day, part of our Stay-Cation 2015. However, the menfolk decided that they didn't want to go. One was already sunburned from yesterday's Sea World trip, another dislikes the beach intensely and the other just didn't want to go anywhere today of importance. Besides, the men had an alternative plan. 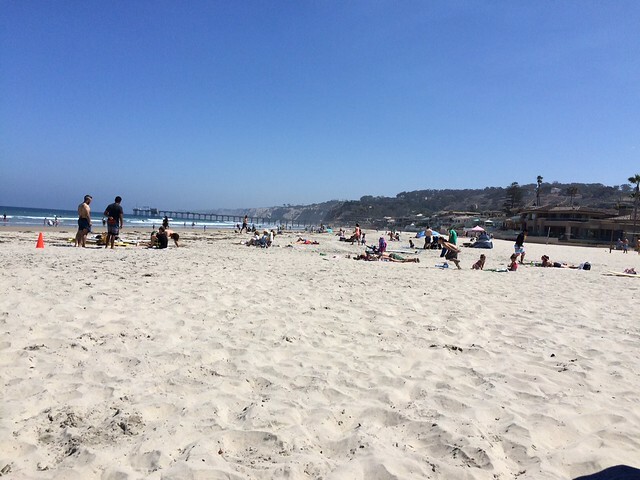 Instead of our "usual" beach, which is located down on one of the Navy bases, we decided to go to a public beach, La Jolla Shores. 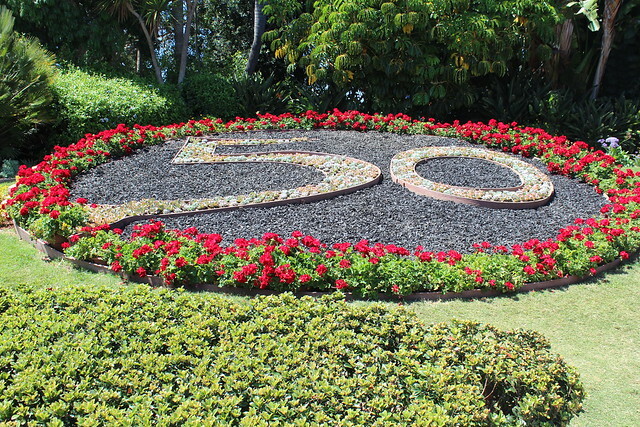 It's located between "downtown" La Jolla, and Torrey Pines area. Sitting on the beach, you look north to the Torrey Pines area, where you can see the hang gliders and the cliffs of the State Park. 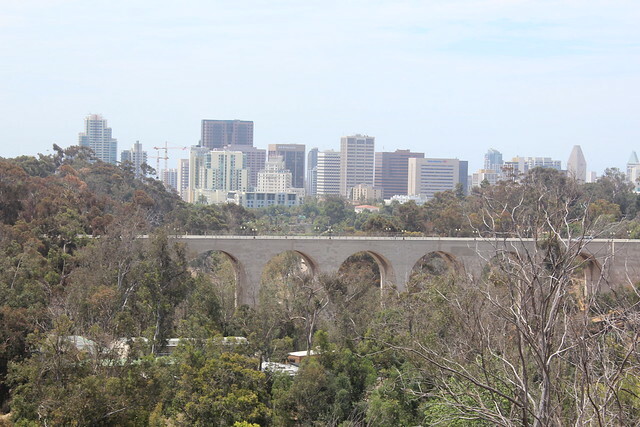 Looking south, you can see La Jolla. 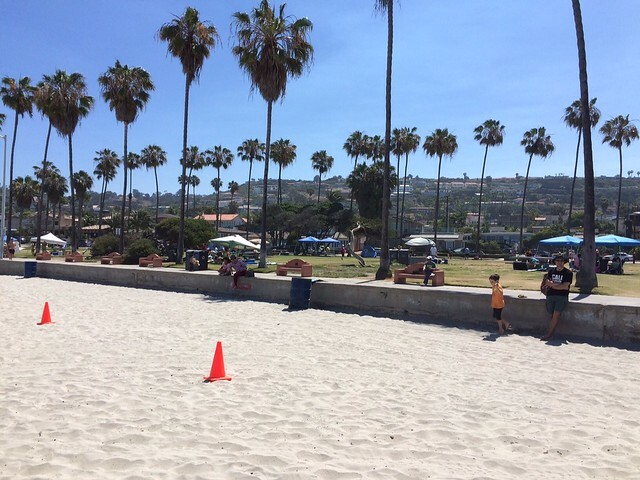 La Jolla Shores Beach and Park has much to offer. Part of the beach is closed to "swimmers and boogie-boarders", and open to surfers. That's where we parked ourselves on the beach (less people). The other part of the beach, a short walk away, is the swimmers and boogie boarder side. I took one granddaughter and we went for a long walk down towards the Scripps Pier. She loved feeling the sand on her feet and taking a walk with just Grammy, no little sister tagging along. A little later, I took little sister and we went for a walk down the other way towards the swimming portion of the beach. She isn't mobile yet, so she just spent time looking around and over Grammy's shoulder. 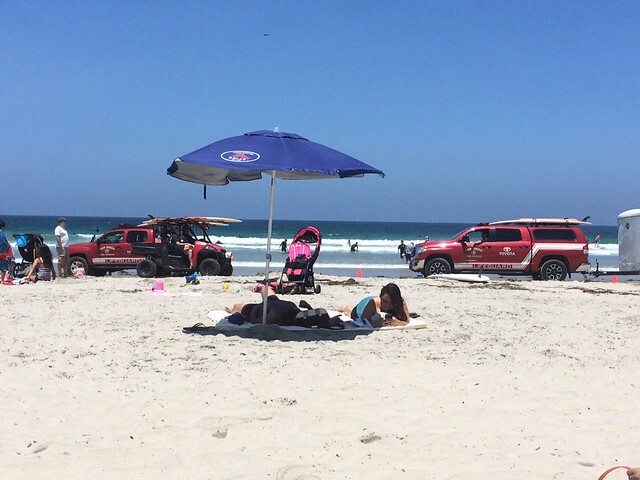 Since it's a Saturday, the Lifeguards were out in full force at this particular beach. They patrolled up and down in gas vehicles and quads, there were lifeguards in every station including the one directly behind us. That one had to politely ask a family to move their beach canopy because he could not see the ocean from his station. There are probably restaurants down the way, but this is one of the beaches in which you must BYO food. We packed a picnic and brought it with us. It's also a very popular beach -- parking lot was full when we arrived at 10, but like any Target at Christmastime, just drive around and you'll catch someone leaving! The early crowds are mostly surfers, and your after-lunch crowds are mostly families. We came between, and managed to snag two parking spots abandoned by surfers. 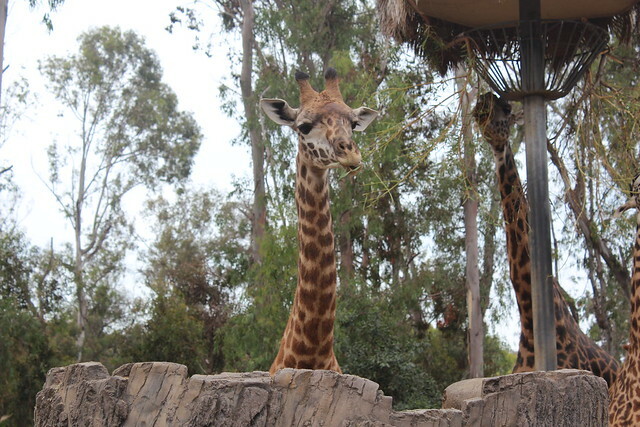 Today's activity was the San Diego Zoo Safari Park, located just east of Escondido. 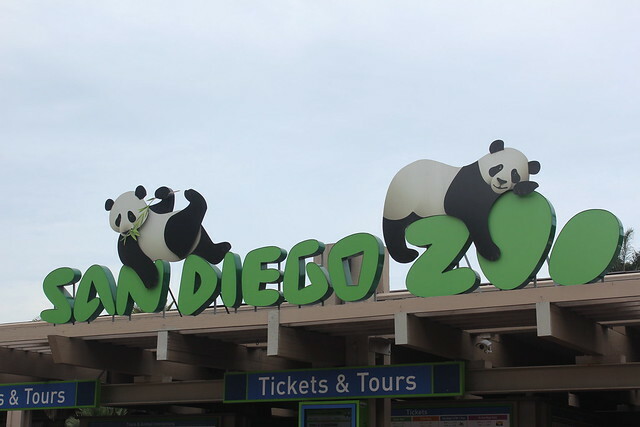 It is a sister park to the San Diego Zoo, and used to be called the San Diego Wild Animal Park until just a few years ago. 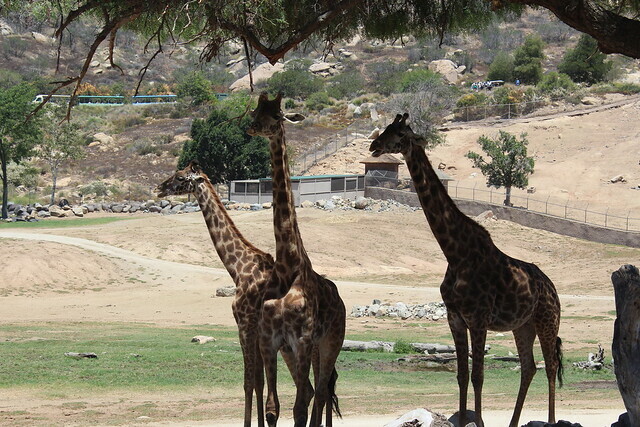 The Safari Park is a large park, with a lot of acreage dedicated to roaming animals and the local flora/Fauna. 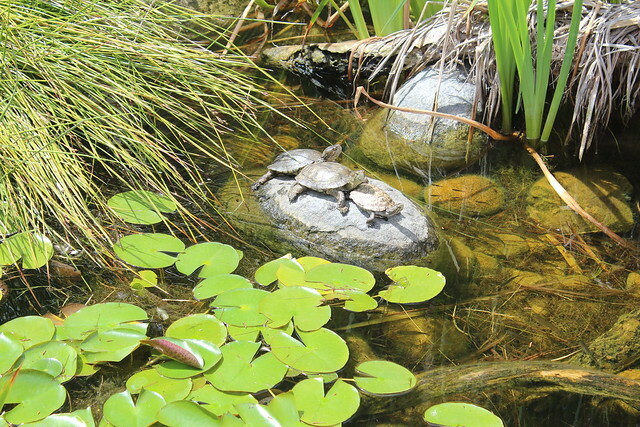 There are many ways to see the park. 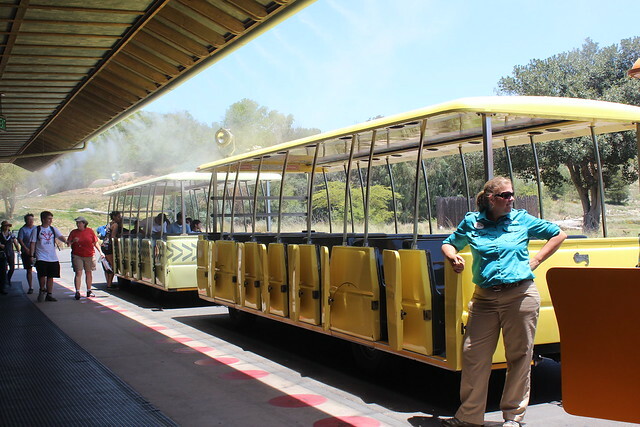 The most common ways are walking, and the tram, included in the admission. Less common, but available for extra costs, are cart safaris (on a golf-cart type thing), caravan safaris, and a few others. 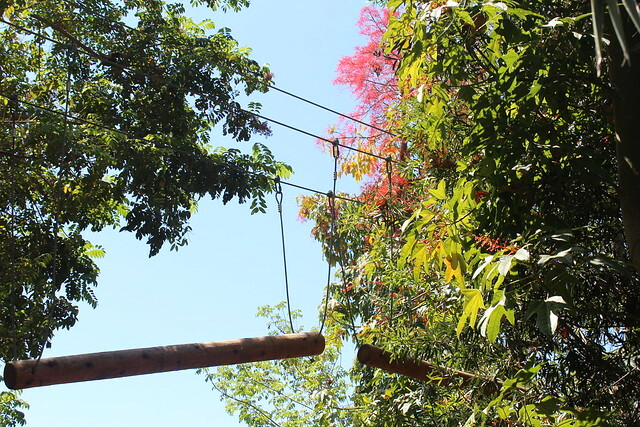 For those that want to be very active, one can go ziplining, or you can traipse through the trees on wood slats ... for an extra price. 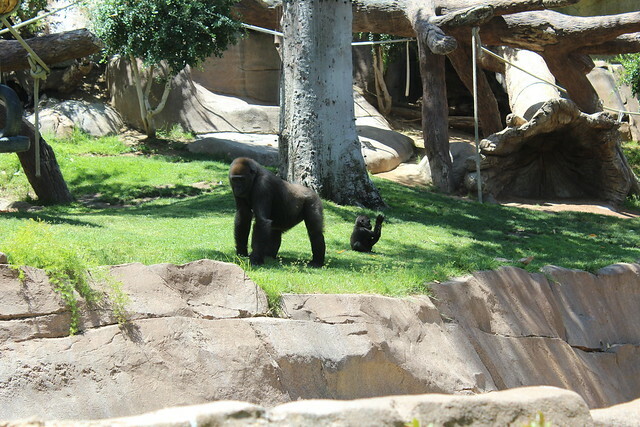 A mama gorilla and her little one. There was also an older gorilla, age 57, that the sign proclaimed was a great-great-great-grandma. Wow! Our national bird. 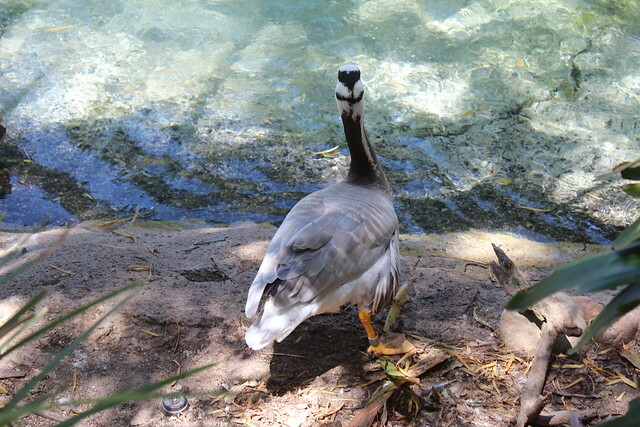 The sign said that these were birds injured in the wild and can never fly again, so they are being kept at the Safari Park for their protection. 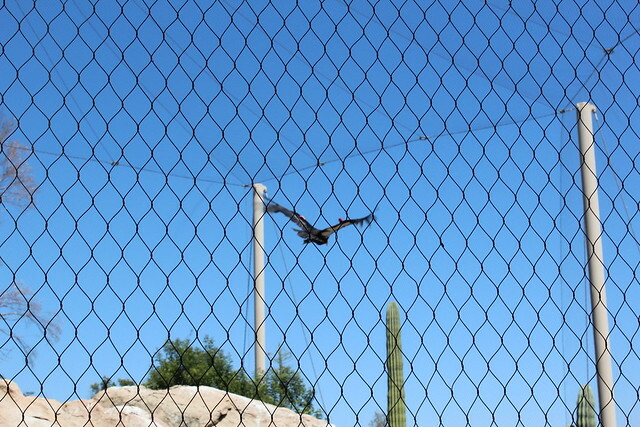 We were privileged to see the California Condor fly. 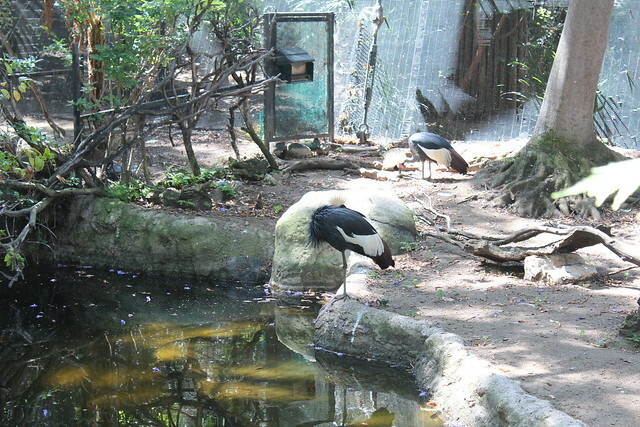 My husband and I have been in San Diego County for so long, we remember when the Wild Animal Park had a condor hatch an egg, and the excitement that caused in the county. 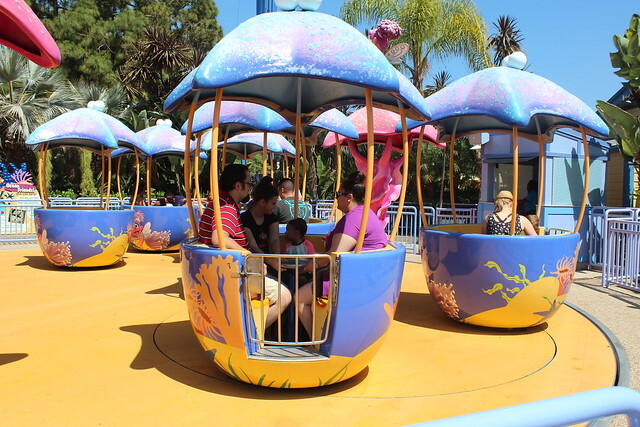 Price-wise, it's about $48 per adult for a day ticket, $38 for a child 3-12. 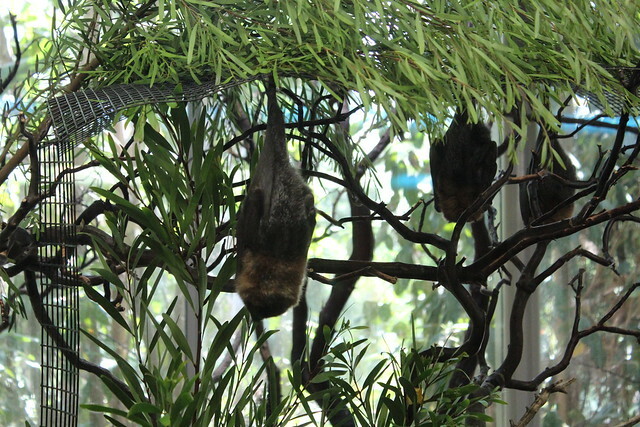 My husband and I decided that this year, we would get a zoological society membership. We were able to "renew", even though we had not been members for a good 20 years. All you need is your old zoo membership number. Basically, it pays for itself at the third visit in the year. Food is less expensive than at Sea World. You can get a zoological society souvenir cup for $10.99, refill it as many times as you want on the day you buy it (I refilled mine 4x), and then bring it back on subsequent trips and have it refilled for $1.29. The park doesn't get annoyed if you bring your own food or drinks in, though. We were there for about 6 hours, I put 5 miles on my feet (according to my pedometer), and we all went home tired and happy! On my daughter's last day visiting us, we left the oldest granddaughter with her dad and grandpa, and she and I (and baby) went "antiquing" -- to the thrift stores. 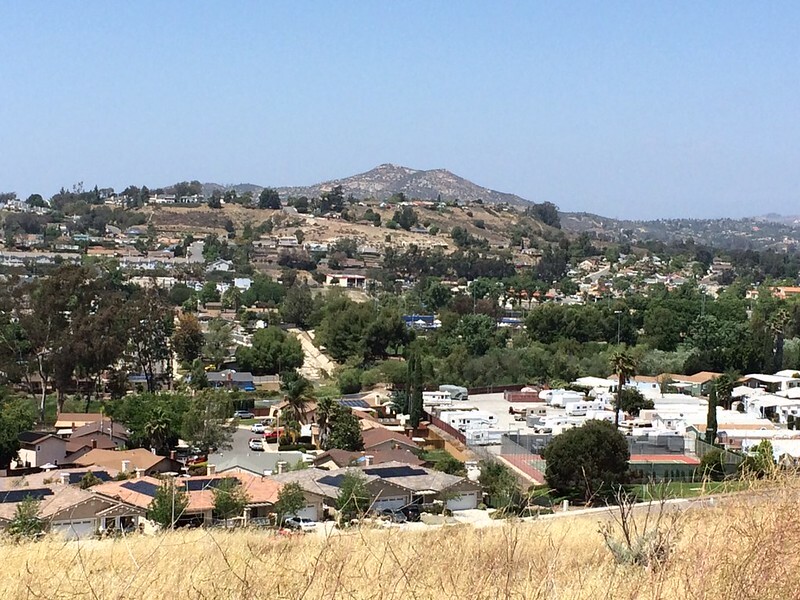 One city near San Diego, Poway, has a whole shopping mall full of thrift stores and bargain stores. It's an old strip mall that is rented out, mostly to charities and churches, for lower rent. (The downside is that the buildings also don't get much maintenance, but that's another story.) This strip mall used to house a small 1-screen movie theater, a couple of restaurants, and a dancing school. Now it's home to thrift stores belonging mostly to local churches -- Catholic, independent charismatic, Lutheran, Presbyterian -- and to the Bargain Hunters "chain". There is also a consignment shop or two in the "mall". You can start on one end of the strip mall and go from store to store. Most carry clothing, furniture, dishes, small appliances, books, DVD/VHS, CDs and vinyl, sporting equipment, and miscellaneous. Of course, any thrift store is 'hit and miss' if you are looking for specific items. Sometimes you hit things just right, and other times you don't. My daughter and I went looking for good baby and preschool clothing, and yesterday's trip resulted in two decent summer outfits for the baby and nothing for the older one. (A couple of years ago, I bought a used Christmas dress for the older one, tags still on it. It was gorgeous. 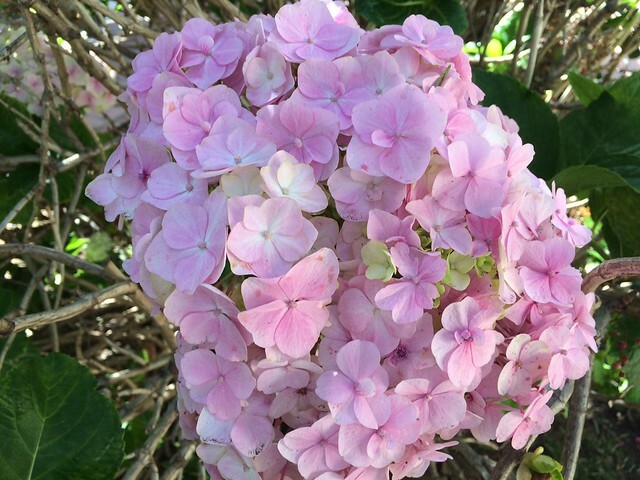 $2.) We looked for books for the children, and my other grandchild, and got a lot. I also snagged three board games, one of them still with the original wrapper on it (ensuring that all the pieces were probably there). YAY! All of these thrift stores like donations, though they each have their "rules" about them. Most of them take the donations through the back door of the store, or via their pickup service. As we went through them, I saw a tent in one of them, and a very old Coleman gas stove that was probably in good shape (Coleman has parts dating back into their 1930s equipment). Seeing these things made me think of RTA, as we occasionally suggest that people buy camping equipment for a trip and then donate it to a thrift shop at the end of their trip if they can't take it home. It was a nice time with my daughter (and the baby). They had to leave this morning, the long road trip back to MO. They are going through Phoenix to visit with my parents, then up to I-40 through Albuquerque and OKC, then I-44. It's the way they came out, but the I-15 to I-70 route would be out of their way considering where they live in MO, now. The two girls traveled quite well, all-in-all-given-their-ages. Mama doesn't mind putting on a DVD if the older one gets whiney, and the noise puts the baby to sleep, so she gets a rest. This is their first long-distance road trip, and as my daughter says, hopefully the first of many as they develop their travel style. We headed to the right, toward the Koala/Australian Outback area, first. I caught this little guy looking really cute. 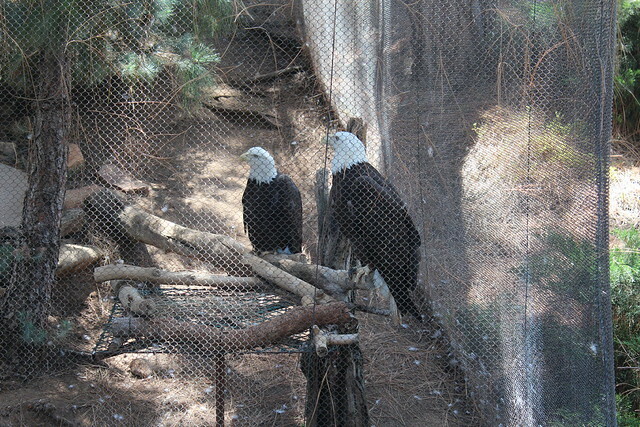 My husband and I hadn't been to the Zoo in years. 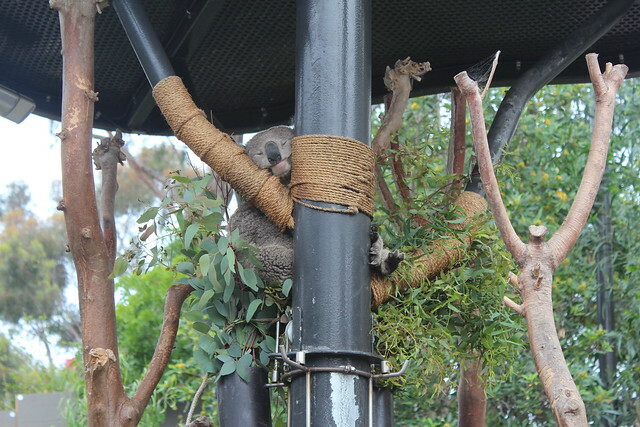 The Koala exhibit, and quite a few other things, had completely moved, been improved, or were in the process of being upgraded. 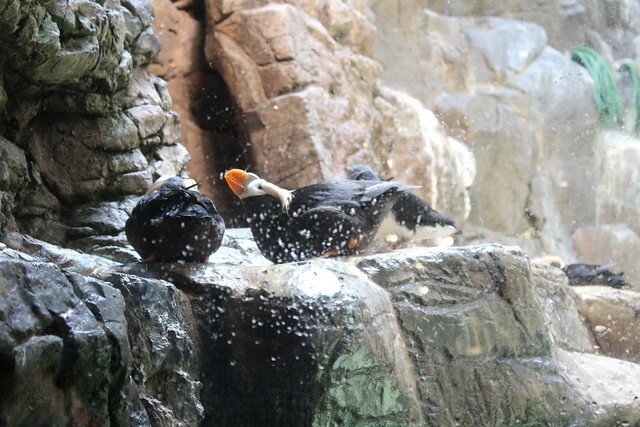 The Zoo still takes wonderful care of the critters it has. From there, we headed up into the current African area, which is being remodeled (for opening in summer 2017). I love the giraffes and elephants. Hubby and I had just watched the movie HATARI (John Wayne) a couple of days ago, too - another reason why I had the itch to go to the Zoo. 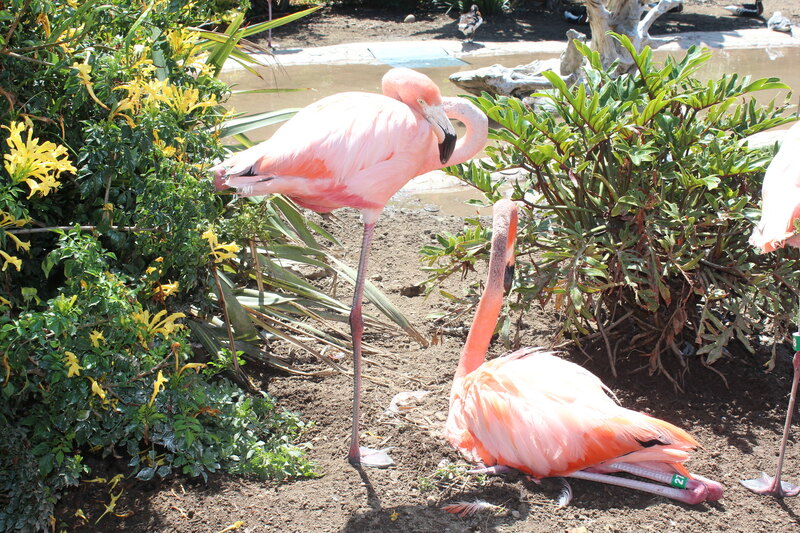 Of course, I love the long-legged birds, and the Zoo has their share of them just like the Safari Park (which is a sister park to the Zoo) and Sea World. 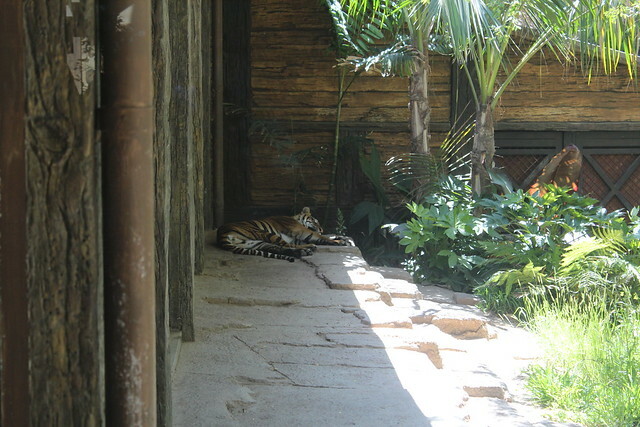 Lest you think that the Zoo is only for critters, it has thousands of plants, trees, and other flora. 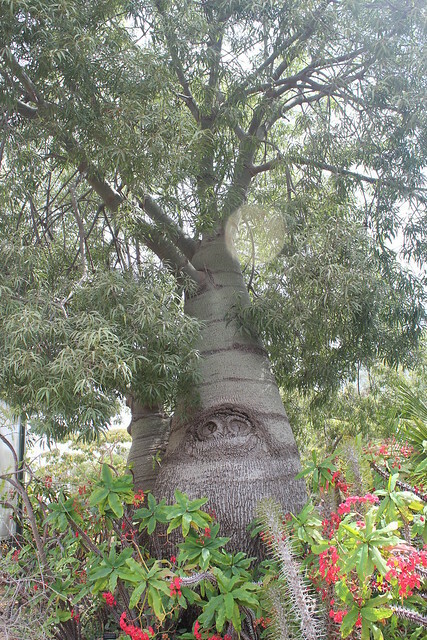 Here is a funny looking tree! 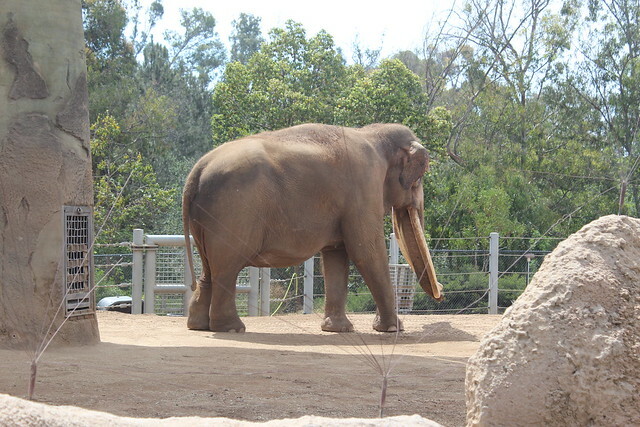 The Zoo has both Asian and African elephants. You can tell the difference by the size of their ears. This big guy had tusks as long as his trunk. 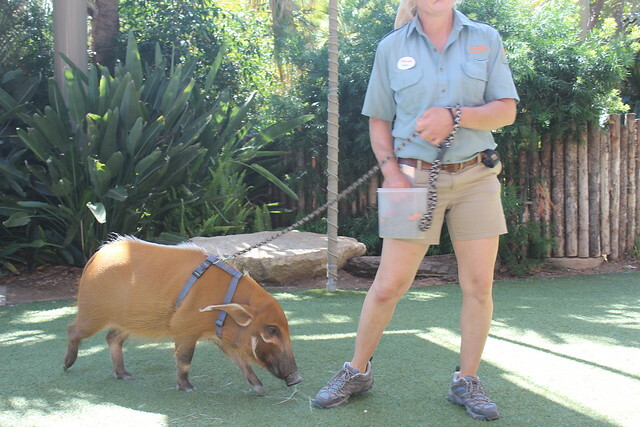 The docent told us that the Zookeepers had to get permission first, but they would cut the tusks whenever they grew so long that the elephant would trip over them. 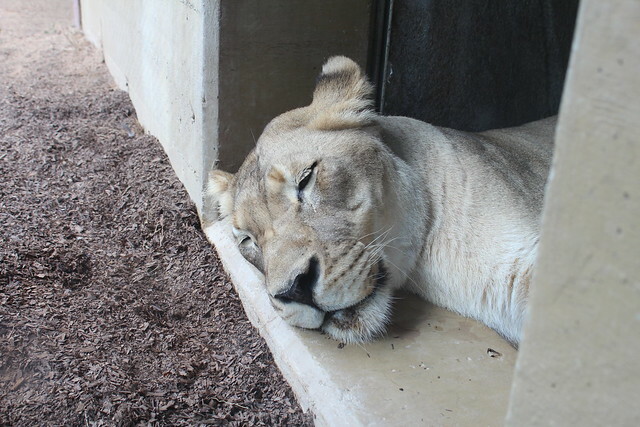 The African lioness was sleeping so close to the glass. I stood there and watched her sleep for a few minutes. After lunch, we got in line to take the Skyfari back to the Polar Bear Plunge, and continue our day.